Note: this is part 3 of 3. Part 1. Part 2. With heavy hearts we left our b&b, L’Ecole Buissoniere, and began our drive to the coast. Our sweet hostess, Monique, sent us on our way with kisses on both cheeks and a box of cookies for the road. 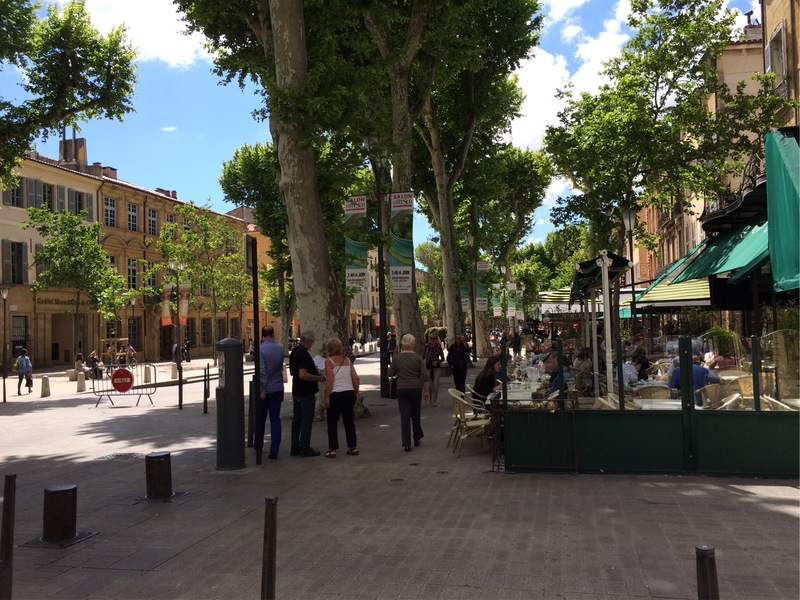 Our destination was the French Riviera, or the Cote D’Azur, and along the way to stopped in the college town of Aix-en-Provence. Aix is a charming town with a rich history and lively people-watching. The Cours Mirabeau is the wide boulevard lined with trees, shops and cafes. We stopped for lunch, did Rick’s walk and grabbed some treats for the road. Within a couple hours the coast was in sight. We inched along next to Nice’s Promenade des Anglais with the bluest water you’ll ever see just feet to our right and as we rolled our windows down to take in the sea breeze, we found it very difficult to mind the congestion on the road ahead. Our home-base for the next couple days would be Villefranche-sur-Mer, a small town just past Nice. We rented a tiny apartment just a couple streets from the water–it even had a little balcony on which we ate breakfast each morning. (It even came stocked with the essentials–milk, orange juice, fizzy water, snacks, WINE!) The local grocery store and boulangerie (bakery) were just steps from our door, which made it convenient to get fresh croissants and fruit each morning. We grabbed pizzas one night and sat outside watching the sun set over the water. 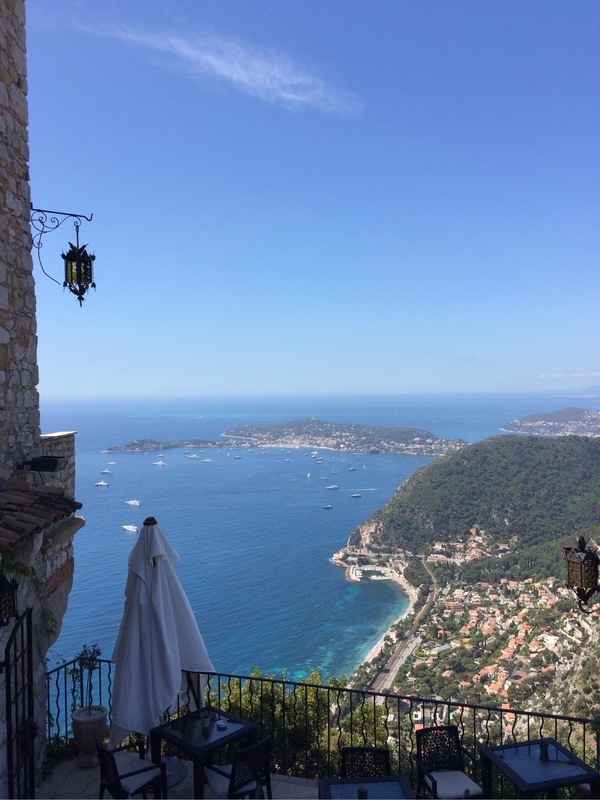 The next morning, we drove our rental car up above Villefranche to Eze-le-Village to explore. 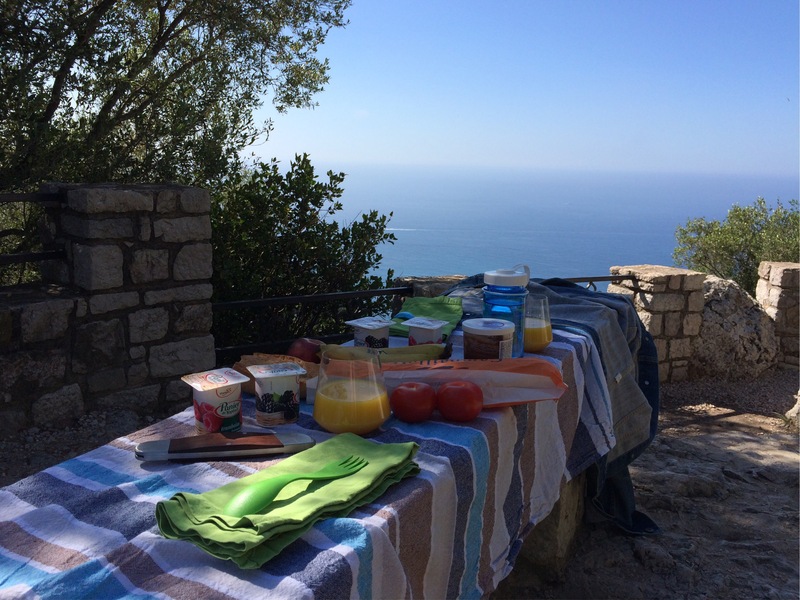 We’d packed a picnic breakfast and scored a *perfect* spot (thanks, Rick!) overlooking the water (and the gardens of an incredibly high-end hotel). We stopped for coffee at the Chateau Eza, which used to be the vacation home of the Swedish Royal family. I decided to take a photo to use as my iPhone home screen; last year’s photo from Collioure was now outdated! Surprisingly, our coffees at $6 each, were quite reasonable considering our view. After Eze, we drove up to La Turbie, home of the Trophee d’Auguste. It’s super old–built around 6 B.C.–as a monument to Emperor Augustus for conquering the ancient tribes in the Alps. Apparently it’s famous for having a very large inscription on one side. 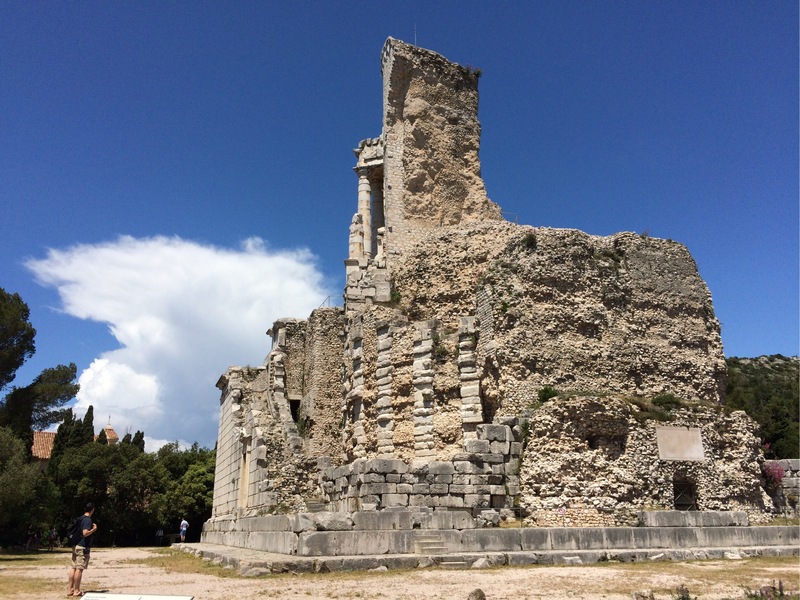 Seeing–and getting to climb up the ruins–was a highlight for Andrew. Even I enjoyed the video in the small museum explaining the restoration work. Afterward, we headed back down the hill and stopped at Fragonard, a famous perfumerie in France. We saw their small operation–everything bottled by hand–and enjoyed the tour very much. Fragonard sources many of their flowers from the French Riviera area, which is why they have a location there. Andrew and I visited one of their shops in Paris last year, but didn’t feel like we had enough of an understanding to appreciate a souvenir. This year, I took home a bottle of their ‘bleu riviera’ and a matching make-up bag to remind me of the Cote d’Azur (blue coast). That afternoon, we dropped our rental car off in Nice (after the perilous switchbacks in the hills and increased traffic from Provence, we were ready to be back to public transportation) and took a tram tour, stopped for beer and ‘socca’ (fried chickpea flatbread), and grabbed gelato at famous Fenocchio’s before hopping a bus back to Villefranche. The next morning we took a train to Monaco (as in, the richest country in the world MONACO), home of the Monte Carlo casino and the Grand Prix. In fact, the Grand Prix had just wrapped up, and as we alighted from the train station we saw the remaining guard rails and expended tires being cleared away from the road. Monaco is where the richest of the rich call ‘home,’ which really means it’s just an address–or where they dock their yacht–to avoid higher taxes elsewhere. The number of luxury vehicles we saw (we aren’t talking Lexus and Audi–we’re talking Lamborghini and Ferrari) was astounding. 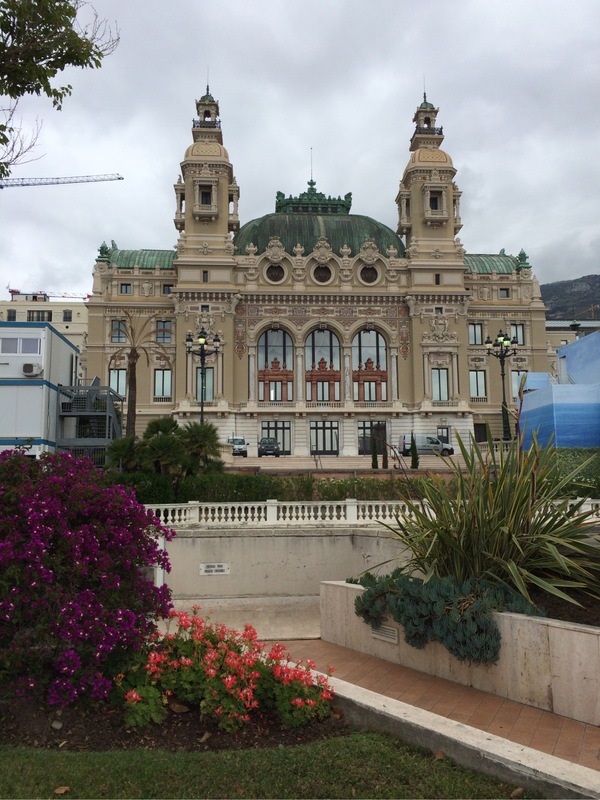 We stopped for coffee outside the Monte Carlo and popped into the lobby for a peek. It’s perhaps the only casino NOT open 24/7; in fact, there’s a dress code after 2 p.m. and the guards made it seem like you might even need an invitation to play at a table! 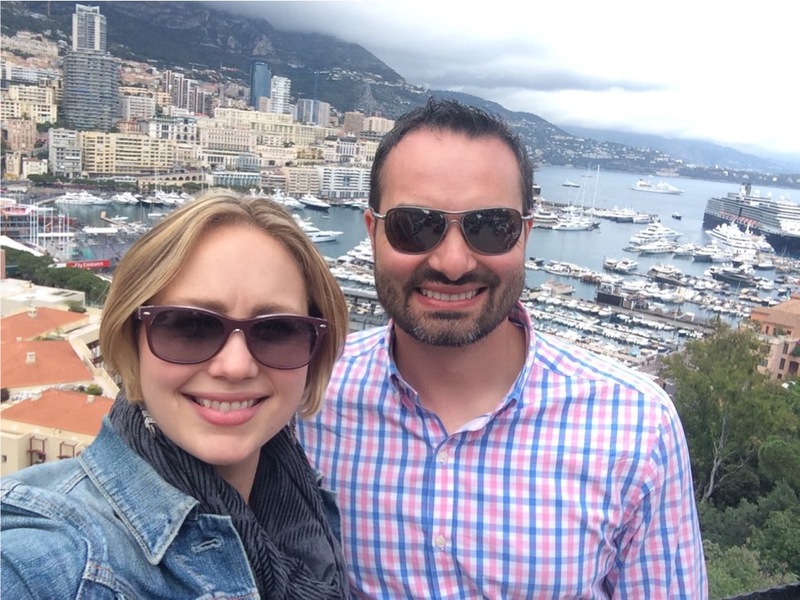 Monaco is pretty tiny–less than a square mile yet the most densely populated country in the world–and we were able to explore it in about half a day. On a future trip, I’d love to see the aquarium there. 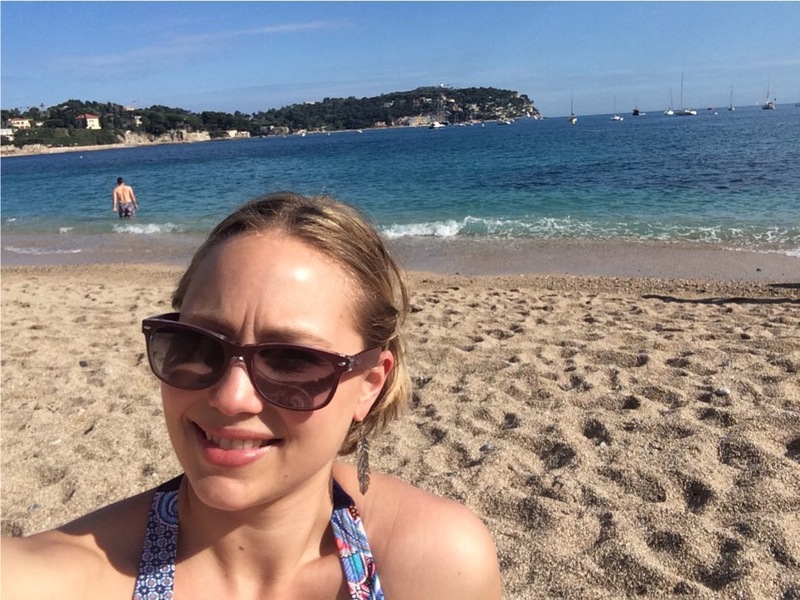 We returned to Villefranche and spent a little time at the beach (check out Andrew in the water–he said it was freezing). We spent the last day of the trip enjoying our little home-base, Villefranche, then heading into Nice for lunch and more walking. We went up to Castel Hill for views, walked the Promenade des Anglais with more gelato from Fenocchio’s. We still had a bottle of rose left at our apartment, so we grabbed some take-out Vietnamese food for dinner, found a secluded nook in the rock’s along Villefranche’s little port and enjoyed the faint nusic coming from a yacht in the bay. Au revoir, France! A bientot!